I picked up a few zines last month. All of them are amazing and linked up below. I highly recommend spending the tiny amount of money needed to get these in your possession. Partner in Crime by Austin McManus. Really nice offset zine about vandalism stereotypes. Awesome stuff. MUX issue 2 from Tj Nelson. Came out fantastic. seriously sorry about this toe shot. Never heard of it by Brad Westcott through Blood of the Young. Incredible Train traveling pics. Got word from TJ Nelson, that the second Issue of MUX magazine is out! Unfortunately the first run already sold out, but the second run can be pre ordered here. Really good looking stuff, hats are off. 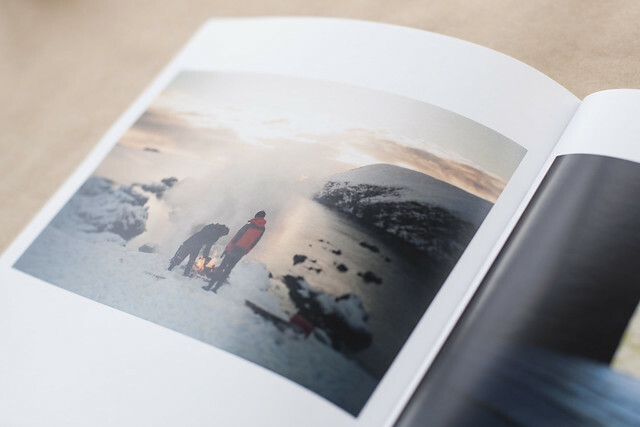 "The idea for MUX came from a desire to connect to photography in a tangible manner. Because of pocket-sized digital cameras and smartphones, we are amongst an unstoppable flood of images on the internet. Which, in its own way, is wonderful, but I find it difficult to connect to images on a screen. I created MUX because I wanted to act as a curator to gather the talent of my peers, and then encourage people to take a minute to hold a collection of work that deserves to be pondered on." MUX issue 02 04.2013. 8.5" x 5.5". 84 pages. Design by TJ Nelson. Photos by matt bublitz, grant hatfield, sam milianta, josh anthony, ephraim chui, spencer davis, charlie wray, trever hadley and brandon getty. $20. I saw online that Sam Milianta was sending out zines to whomever wanted one, so I raised my hand, and was sent two: Alone with Everyone, and One Day it'll All Make Sense (Or Maybe Not) Conclusion: Sam rules. Get your hands on one. 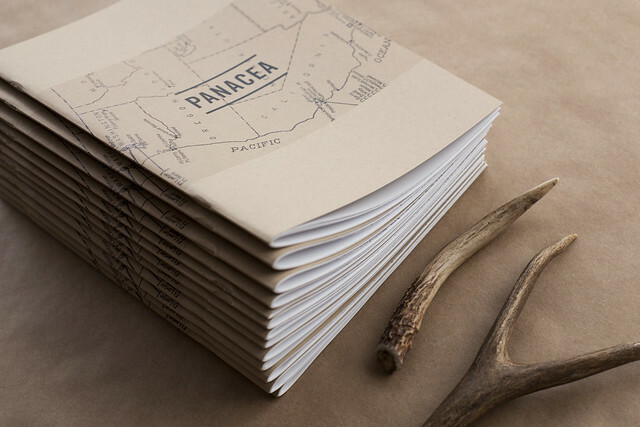 Thanks to everyone that has contributed or purchased a copy of PANACEA. Only 20/100 physical copies are left! The remaining copies can still be purchased for $15.00 here. As a token of our gratitude, please enjoy a pdf version of the book for FREE. 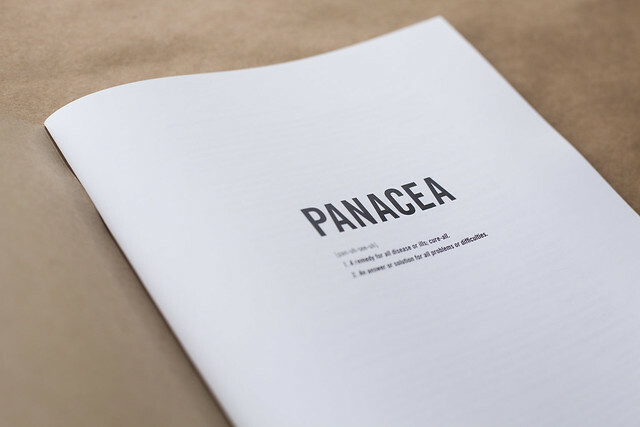 Happy to announce the release of PANACEA, a collaborative photography book, published by BIT BY ZEUS and Ladder to the Stars. The book features photos from 37 photographers and will be released Feb 1st 2013 @ Mua Oakland. 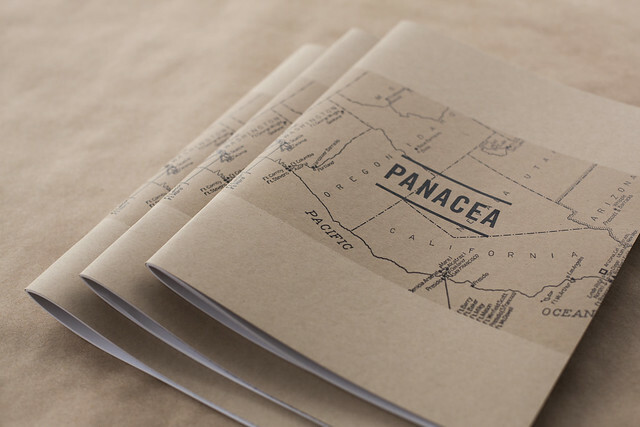 PANACEA is printed color offset, 8.5″ x 11″ and will be limited to 100 copies. In addition, there will also be photo show hanging at MUA, featuring the photographers from the book. It'll be first friday: Oakland Art Murmur; Check out the art downtown, come say hi, grab a drink (and a book) and check out the show. —Over the last year, I've been working with Elias Carlson, who runs awesome blog, Ladder to the Stars. Early on, we found that exploring nature was a common thread in our photography. We discussed our need to get outside and take photos, and we decided to make a publication about it. We knew that we wanted to publish a collaborative book featuring photographers that we both respected and that shared this common theme. We worked on the idea of the "need" to get outdoors and found a definition that we felt summed up this idea; "PANACEA" which is defined as "a solution or remedy for all difficulties or diseases." The ring to it was nice, but the definition really hit home for us, as it summed up the feeling that we both had: Exploring nature as a cure. Free newsprint zine by Corey Riddell found at the 40th st craft faire yesterday. 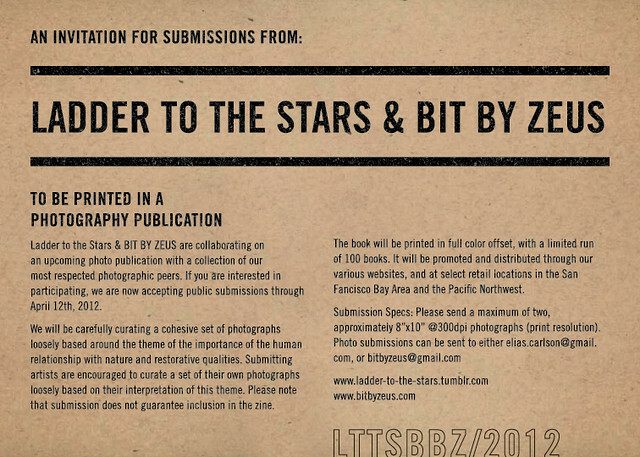 Elias Carlson of Ladder to the stars and BIT BY ZUES are teaming up to create a photo zine/book. We’d like you to be a part of it. Click through to read all the details. Feel free to reblog/share if you know people who would like to submit. Here is a few zines that I have bought or received in the last month or so. The first one I received through the power of the internets all the way from Spain! Here's a few pictures of Humectante #5 by Helena Exquis. and finally, this sweet zine, 777 by David Potes. I FEEL BETTER is a zine containing twelve mounted 5x5" color prints of mostly recent photography by Tim Gatto. Edition of 20, hand bound—hand pulled silkscreen cover, 5.4" x 8.5". $5.00 flat. Now available for purchase here. A few weekends back, BIT BY ZEUS had a table at this year's SFzinefest. Met a bunch of cool people and sold some zines. this dude liked our zine. these girls kinda did. i guess. Amy, from 1984 printing, who printed our zine, was there and had a sample copy of Issue #1 at her booth! the zine reading room had some awesome old punk zine's on display. Ended the weekend, donating a copy of issue #1 to the reading room. All around great event. See you next year! with ridiculous photo shoot. This Saturday and Sunday in SF. Check it out! BIT BY ZEUS will be at this year's SF ZINEFEST!!!. If you haven't picked up one of our zines, come by the weekend of Sept. 4th and 5th and say hi to the two of us, grab a zine, and check out a bunch of other great work. It has been almost a decade since we learned about the now demolished Skaggs island. The once thriving naval base, is now a flattened landscape, which will soon be flooded and returned to its natural wetland state. We recently went to pay our last respects to such an inspirational spot. Check out our shop to own the last documented account of Skaggs in all its decaying glory. We are very excited to see BIT BY ZEUS Issue #1 on BLOOD OF THE YOUNG ZINE. Thanks guys! 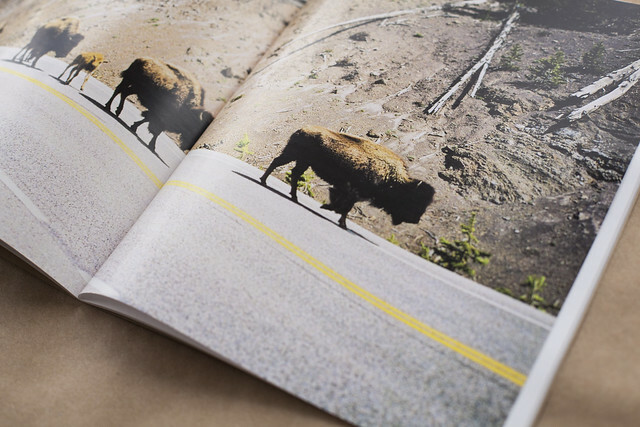 Thanks to our friend Ryan Gelow for posting up a great review of our zine on his blog. Check it out.